Absolutely Experiential, Inc., founded in 2004, has built a reputation for delivering the highest quality course design, and for providing reliable maintenance services for camps, businesses, and other organizations. In, 2008 AE was selected to be the on-site consulting company and provided the lead construction crew for one of the largest aerial adventure parks in the U.S., which opened May 2009. 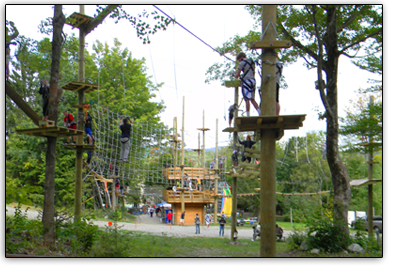 AE has been involved in the design and constructions of over 80 challenge courses and is currently exploring opportunities for the construction of aerial adventure parks in the U.S. and abroad. AE also offers high quality staff and management training for challenge courses; AE also develops and facilitates programs for public and private schools at all levels including colleges. AE Programs engage participants physically, cognitively and emotionally. Using the goals defined by the group as an outline, experienced facilitators present activities that metaphorically simulate real life situations, prompting participants to transfer the lessons to their own personal and professional lives. Communication, leadership development, goal setting, teamwork, trust, problem solving, decision making, and conflict resolution are some of the skills that AE programs help develop and enhance.